The usual claim students have regarding the teacher is that he doesn’t give them enough attention, which they feel that they deserve. But the matter is the lack of vessels on the part of the students, as a result of which they cannot absorb more and so they don’t feel that they receive even more than they need, but on the other hand, they cannot manage to wake up by themselves. The teacher should not come to wake up the students. It won’t help, since they receive the awakening from Above. I go to a place where people are awake and ready, and then I can help them organize and connect more strongly. But first they have to make their own efforts. A student doesn’t understand that he doesn’t have the vessel to receive what the teacher gives him. You don’t have to wait for me to come and wake you up. It is impossible to wake it up that way if you haven’t prepared a deficiency in advance. The moment you are ready for that, of course I will come. The upper force controls and manages everything and below it there are “ministers,” forces that sustain all of reality. Reality is man, one soul, in which the Creator’s action, His thought, the active force exists. This force is divided into many parts, into individual forces that operate on several levels and which seem to be opposite from one another on different levels, so the created being feels that this action is performed on him as if without any order. This is intentionally done so that we will be confused by the apparent disorder and will have an impression that is opposite from the truth, as if there is no Creator in reality, but only the created being’s force or some additional forces. We may think that the Creator exists, but His leadership is bad and has many flaws. Besides, the existing force seems to be aimed as if against the Creator and that everything doesn’t come from Him, in order to raise us above our corporeal reason. But if a person really desires to see the King as the upper manager and to discover this above his own nature, then his perception is corrected and he discovers that everything is already ready for this correction. He fights in order to purify his vessels and to bring them to a state of to bestow in order to bestow by guarding the King, and at the same time corrects his vessels so that they will be to receive in order to bestow. In the first war he acquires the force of faith, and in the second war he acquires the Light of Hochma, the understanding of the system, its plan, the reasons, and the goals by working with his vessels of receiving. Thus he learns how to understand and feel the upper Providence, by crowning the Creator as the one who rules above all the forces. It is because all these forces, both His ministers and those who seem to be His enemies, different criminals, murderers, and robbers, unite as a result of this war and as a person attributes them to one King. He understands that the war is not against the forces that are hostile to him, but against himself, in order to discover the Creator in all these forces. This is the essence of all the wars. Although we hear that “there is none else besides Him” and that He is good and benevolent, we have to go through all the levels in order to really feel that. We still have a long way to go in correcting ourselves through all the states that the Creator presents to us, by teaching us the art of understanding and the attainment of the system of His forces through them, so that we will be able to understand and to feel Him. To feel Him according to the rule of “from Your actions we shall know You.” Thus we gradually become more like Him. Question: How can the desire to receive work in order to bestow? Answer: It can if it has an intention of in order to bestow. In that case it gets a desire from someone else and that enables it to bestow. Keter created the desire to receive, Hochma. At the end of this phase the desire felt a spark of bestowal, made it is main part, and now wants only to bestow. 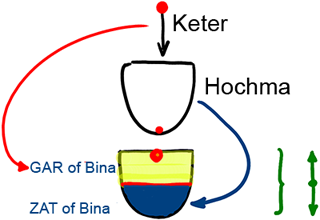 Thus Bina was created, and its first three Sefirot (GAR of Bina) are similar to Keter. 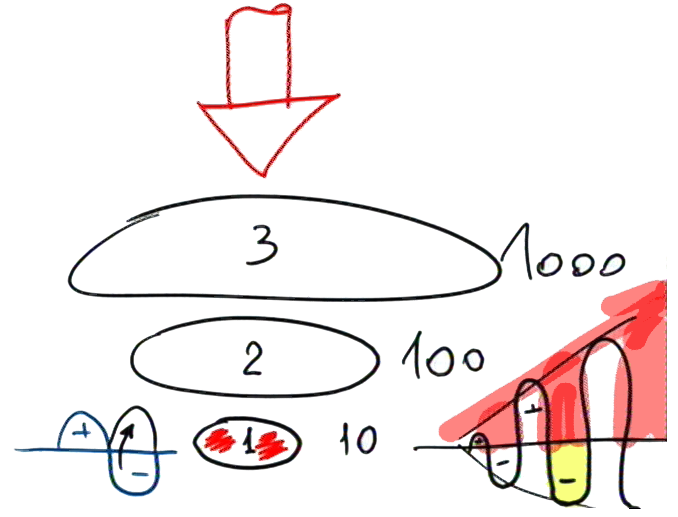 Just as in Keter, the red point (in the drawing) determines the essence of Keter so does bestowal determine the essence of Bina. 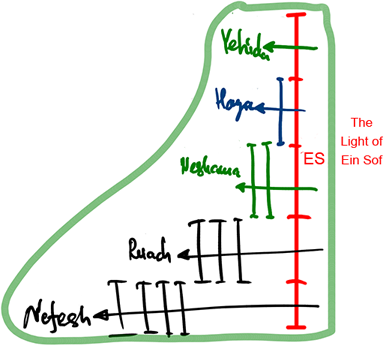 As a result, the created being becomes similar to the Creator and follows His examples: Keter created Hochma, so Bina, too, took its lower half, the seven lower Sefirot (ZAT of Bina) from Hochma. The question is whether it is receiving or bestowing when the lower part of Bina receives the Light of Hochma. On the whole, it is about the action of the point itself, which feels bestowal by this action. The upper part of Bina is a desire to bestow that is aimed at the Creator: It wants to bestow like Him (↑), and in order to do that it receives (↓). Its bestowal is actually in the filling of the seven lower Sefirot. In the same way a mother feeds her baby and is happy for him, which means that it is possible to fill the vessels of receiving and by that to bestow. 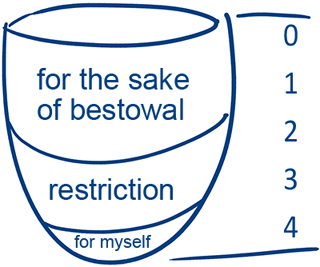 Question: So how do the vessels of receiving in our case turn into vessels of bestowal? Answer: After they are “restricted,” they are filled with the Light of Hassadim, this is already to bestow in order to bestow, Lishma (for Her Name). Then we can use them even to receive in order to bestow. Thus they become vessels of bestowal, since to receive in order to bestow is pure bestowal. This is the only way the created being can bestow. On the other hand, to bestow in order to bestow doesn’t mean that it is real bestowal. It is only the preparation for actual bestowal, and this is the process of the correction of the vessels. Question: How do I make a covenant with the Creator if I don’t know Him? Answer: The question is: Why is it only the groom who signs the wedding agreement (Ketubah) and not the bride? Is there a kind of one-sided commitment here? The same happens when a person signs an agreement with the group or with the Creator. This means that my signature on this contract is enough since the agreement of the other side is certain. So, only the one who hesitates and is unsure has to sign, and thus, he is obligated to sign the commitment. There is an upper force, and in order to reveal it, there must be a lower force. The force of the upper is bestowal and the force of the lower is receiving. The force of the lower must attain wholeness in its deficiency in order to connect to the upper force that is eternally whole. Wholeness is attained in the lower force by the connection of 10 people, for example, then of 100, and then of 1000. We always add another zero. Unless I connect with 10 people, I cannot be called a spiritual “unit,” and, unless I connect with 100 people, I cannot be called a second spiritual “unit,” which means to rise to the second spiritual level. The counter only counts the additional zeros, and this is considered a leap to the next level. In order to be adapted to the whole upper force, I at least must attain the connection of the first 10. This means that I must connect to 10 people since according to our inner nature, we attain the first, minimal measure of bestowal, #1, by the connection of ten people as one heart and one mind. Now, I have the first force of bestowal. If I can connect to 100 people in a similar way as one heart and one mind by totally annulling myself, I attain the second force of bestowal, the second spiritual level. Thusly, I must go through 125 levels. In order to connect with them, I sign a mutual contract. We must be connected so that each one will forget about himself and connect with everyone as one whole. It is impossible to do this alone and we must help one another. We must provide everyone with the greatness of the goal, connection, warmth, and positive examples. In order to do that, we sign a contract, and this is called a covenant. Each of us goes through states of “+” and “-,” and we need the minus in order to rise to the plus, to “straighten” ourselves. This is possible if, while I am in a state of “minus,” the society intensifies my intention. My minus grows and the plus also grows; they constantly increase. After a small plus, there is a big minus, and after a big plus there is a minus that is twice as large. This is why I never can overcome the minus that I receive and it always knocks me to the ground. I may be totally thrown off track, and I may continue to work, but without any inspiration and thought. When I fall into such a state, into such a minus, the society has to intensify my intention. It is a good thing that I have received such a minus since I need a greater minus; I must reach its full measure to fill my measure. The question is how to turn it into a plus. In order to do that, I need an intention! If my deficiency and the society’s intention connect, I can change the minus to the plus each time and, thus, constantly rise. This is called making a covenant. Opinion (Oxfam): “The world’s richest 100 people earned enough last year to end extreme poverty for the world’s poorest people four times over, Oxfam has said. “The charity said an ‘explosion in extreme wealth’ was hindering efforts to tackle poverty, in a briefing released ahead of next week’s World Economic Forum in Davos, Switzerland. “Releasing The Cost Of Inequality: How Wealth And Income Extremes Hurt Us All, Oxfam said the net income last year of the 100 richest people was 240 billion US dollars. My Comment: No charities can correct the situation, and what arrives to the starving population does not contribute to its development, but rather leads to its degradation because it is not accompanied by integral education. So, even if all the rich had shared with all the poor, the world would not have become better. On the contrary, it would have become worse. Until we eliminate the root cause of our problems— our egoistic nature—all of our actions, being egoistic, will always bring a negative result. The only problem is that the action is far removed from the result and we do not see their connection. We need to initially combine help with integral upbringing, not just education, and then we would attain the development of humanity, which would be capable of establishing itself in a new world. “But the claim that only deeper EU integration can save the ‘European’ social model from the onslaught of emerging markets is not true. Yes, globalization represents a challenge to all EU member states; but it is not clear how more integration would help them to confront it. More European economic governance is not a panacea. “In fact, it is not even clear which European social model needs to be saved. There are enormous differences among EU members in terms of the size of their public sectors, the flexibility of their labor markets, and almost any socio-economic indicator that one can think of. The common elements that are usually identified with the ‘European’ social model are a quest for equality and a strong welfare state. “The key to ensuring the future of Europe’s social-security systems, and thus its social model, is faster growth. And, again, it is difficult to see how more Europe would improve the situation. The obstacles to growth are well known, and have existed for a long time without being removed. The reason is quite simple: if there were a politically easy way to generate growth, it would have been implemented already. “Moreover, most national policymakers have a tendency to blame ‘Brussels’ for all of their difficult choices, thus creating the impression at home that the economy would improve if economic affairs could be managed without EU interference. More integration is preached at the European level, but implicitly portrayed at home as an obstacle to growth. My Comment: It is necessary to look at the pressure put on us by objective natural forces of our development. No problem can be resolved internally within a country but only through their complete integration. But this assumes a preliminary change of general thinking from egoistic to integral thinking. This can be achieved within a few months by the method of integral education, which was not done before the formation of EU. But of course, the claim that integration will not save the EU is a profound mistake. Rabash, Letter #29: But a person doesn’t have a need to bring waste from the outside, as is the case with fertilizing a tree. It must translate impurities from the world to the revelation, meaning, inside his feeling. Question: What is “waste” for me and what is “fertilizer”? Answer: It depends on your choice. You are given the ability to decide whether you prefer to eat from waste or good things from bad things? And you always choose something from the two possibilities, but gradually tip the scale in the direction to bestowal. You don’t have the strength to completely annul reception, but anyway, you advance in the right direction. In your vessel, Kli, there are always three parts. In the upper part you can work for the sake of bestowal, in the middle part restriction reigns, and in the lower part is something that you want for yourself. The right line can’t exist without the left line, and the left line without the right line. Everything needs to be diversified, until at Gmar Tikkun (the final correction), all the evil will operate as good. Question: This means that if the friends create an obstacle for me, then they give me “fertilizer”? Answer: It depends on your meaning of “obstacle.” If the friends show me how much they long to recognize the greatness of the Creator, for a higher level, for adhesion, for Gmar Tikkun, for unity and connection between them, for the revelation of the Light, then for me it can be an obstacle since this approach is hated by the ego, but it can also be a motivation that pushes forwards. The upper shows the lower the Light, His bestowal, and the lower, by feeling this, must clarify if for him this is food or waste. It is written, “Straight are the ways of the Lord, in them the just walk, but sinners stumble in them.” I can decide that bestowal for me is specifically the Light that pulls me forward. I want to adhere to it and overcome myself in order to do this, even though it is not simple to receive it as food. And then, in this case, I am called “righteous.” But if I don’t want it, then I am called a “sinner”. In this way, I examine myself according to the principle of “a person will always see himself as half-righteous and half-wicked.” The upper gives me the Light and I can feel it like light or like darkness. For example, today in the lesson there were many people sitting there without a good mood. And I was very happy about that. Because that is how a disease is discovered. It is very good. Now what is left is to bring the treatment. But they don’t think so. They feel sick. This means, the question is: It depends on how a person decodes what he receives. There is no evil in the world, but everything depends on how we interpret what happens. 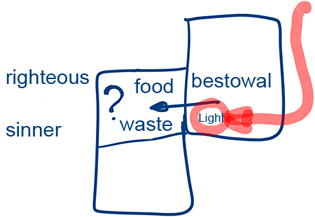 For me, the Light, the force of life, can be either food or waste. The tree, naturally, receives fertilizer from the animals, as a good thing, and we have to choose, because from the beginning the “fertilizer” that arrives from the upper doesn’t look good to us. This thing doesn’t look good to me to the extent that it looks like “excrement” and not like a treasure…. Question: What is the meaning of the words of the Creator: “I wish they would leave me and my Torah would uphold”? Answer: This means that man makes the wrong efforts, in the wrong place, at the wrong time, and for the wrong reason. There are many conditions that must be joined together. First of all, one must organize a group. Without a group a person doesn’t know how to exit his ego. He can talk about this with pretty words, but in actuality, will not realize anything. And in addition to this, one must be patient, to understand that it’s an accumulative process to which all our efforts are added, which then bring us results. It’s comparable to a meter, in which there are spinning wheels, and at a certain moment, suddenly the number on the display changes and a “1” appears instead of “0.” And then again the wheels spin for a long time until outside again the number changes to “2” and so on. We must understand that weeks or months could go by until the meter changes to the next number. But the weeks don’t pass if at that time we don’t invest efforts. Here the person begins to understand that he has no strength or desire, that he isn’t able to do anything, and just wants to leave everything. The body pulls him to empty matters, and the main thing is not to feel his state as being a difficult one. We already understand how this happens. Here the person needs to find himself support, “Support of the Light.” This means the friends who help each other. Our weakness is that there is no mutual help, and everything is built only on it. Strength is only in connection, and if the connection stops, then no one will have strength. The Light illuminates from the other side and slowly increases my desire to receive by just one gram, and I immediately fall. I am ready to forget everything, lie down and do nothing, just to be left alone. At least from a physical standpoint it is forbidden to let ourselves fall in this way. The environment should put pressure on me, they should call me if I don’t arrive at the lesson, and they should wake me at home. I must make these arrangements with my environment so that it will work on me. Also at home, I build such a system that won’t let me miss the morning lesson. I do the same with the friends. I prepare myself in such a way that my conscience will suffer if I don’t arrive at a lesson. But I must prepare all of this in advance and not at the time of descent. I must worry in advance for something to commit me to arrive for the lesson even when I lack strength. I arrange everything in this way so that I can’t stay home; otherwise, what will my family say? I can’t make excuses each day that I don’t feel well. And the friends would begin to call and ask what happened to me, where did I disappear to, and it would embarrass me. If I receive a burdening of the heart, then only these measures will work on me. In those moments, I myself am not able to do anything, but I feel that I prepared support for myself and so it also stands in my favor.